I realized this week that I’ve been out of touch with my sin. This is astounding to me, because I try so hard to be good and do the right thing. I’m a touchy-feely person who often articulates her emotions. I feel guilty a lot. I just studied sin with a friend. So I would have thought that I know very well what my sins are. But when I read a chapter on forgiveness from the book my friends and I are going through, I felt tied in knots. I couldn’t connect. And as I’ve thought about this since, I’ve realized that I don’t want to think about my sins. I beat myself up too much. I have an overzealous conscience. I don’t want to feel worse! Plus, I don’t know how to come before God. When I do, I say things like, “Forgive me for not doing so and so.” It’s something I feel badly about, but don’t really feel sorry enough to change. And when it comes down to it, I’m not sure it was wrong. I know it’s probably my guilty soul telling me it was. So asking for forgiveness seems off. I decided that I would trying going back to the Bible. I read a couple of passages that list sin (Gal. 5:19-21, II Tim. 3:1-5), and wrote down which transgressions applied to me. This was much different! Here are some of the sins I could clearly see in my life in the last few days: being envious, having selfish ambition, being a lover of self, being ungrateful, being unforgiving, having anger, having pride, and being lover of pleasure. This time, when I thought about my sins, I could have the correct perspective about them! I knew they were wrong. I knew they were destructive. I knew they hurt God. The subsequent light that went off in my head was this: I have been unconsciously thinking that sin is not being perfect. I tend to see God as always wanting me to do better, so sin to me is an extension of that. If I don’t live up to that standard in my mind, that is sin. No wonder I’ve been off kilter! So now my goal is to go back to the sin lists each day. After all, Jesus said to pray each day for forgiveness of sins. I want to practice this in a much better way. And here is what makes my heart happy: I can feel more forgiven. That is where I was getting stuck before. 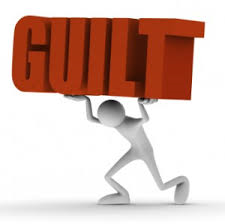 I couldn’t feel as forgiven because I had this impossible measuring stick I was holding over myself. But with a finite list of real sins, I can ask for forgiveness and know that God forgives me instantly! The real bonus is that when I feel forgiven each day, I can be free to love more. I can love God more, and others better. Being forgiven truly is truly something we all want so desperately, and few of us find. And just when we do, Satan confuses the issue and get us out of touch. Let’s use our Bibles. God is waiting, like the father of the Prodigal Son, to welcome us into his merciful arms. Wait! Jesus had just been talking about fig trees and mountains throwing themselves in the sea, about faith and fruitfulness. How did forgiveness get thrown in there? One reason is that forgiveness is so vital. You know why I think we need to forgive people so much? It’s not necessarily because they’re always sinning against us directly. It’s because we’re always getting indignant. We rail, “How could they do that?” We get huffy, “I can’t believe they said that.” People just blow our groove. They disturb our peace. They interrupt our flow. They don’t conform. They disrupt our idea of how the world should go. Notice that Jesus calls what we do “holding” something against someone. This is so true. We keep our grudges close, like they’re a possession. We nurse them. We love to think about how wrong that person is. We don’t let it go. The bottom line is we don’t tolerate weakness in others well. Yet we are all weak. Yes, we may be baptized disciples. We may have repented and changed to be a better person. But there are parts of our character that take time to transform. Deep change is a process. We’re all on a journey. I love to read and write fiction. You know what makes a good story? Character growth. 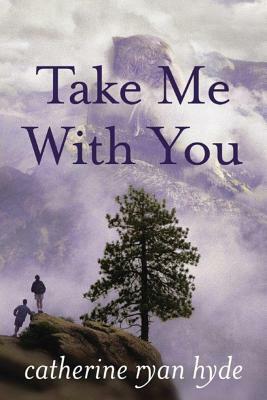 I’m reading a book by Catherine Ryan Hyde, and there’s not a lot of exciting action in the book. It’s just a story of people going through real life challenges. But it’s a great book because the characters in this story are so flawed and real. They have to overcome timidity, immaturity, fear, resentment, hurt, and when they finally do, the reader rejoices. I don’t pretend to understand the workings of God, but it’s the same for us. Our characters are forged through life. And there’s nothing more inspiring. As I look around church, I see people who are changing on the inside over time. It’s impressive to see how different they became when they studied the Bible. But it’s maybe even more moving to see what they become through the years as God works on them. It’s amazing to remember the trials they went through, and see them triumphant on the other side. 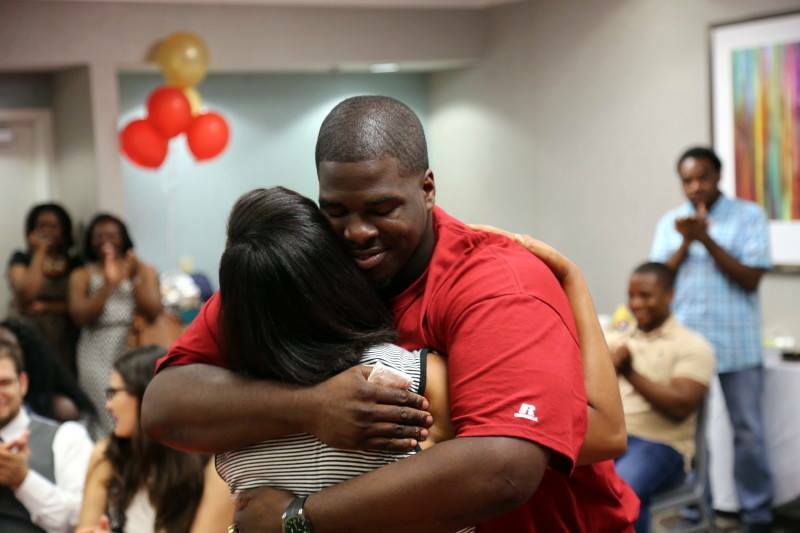 It was so encouraging to honor Tuskegee graduate Devonte Jones last Friday, and celebrate all he has done. THIS glorifies God SO MUCH! So we can’t be afraid of weakness in others. It’s their journey. We’ll cheer them on, and help them along the way. We’ll pray fervently for them. And then we, and the Universe, will watch in anticipation to see if they will CHOOSE to overcome, if they will call on God to help them overcome. Not everyone will. That’s what makes it so powerful and compelling when someone does. 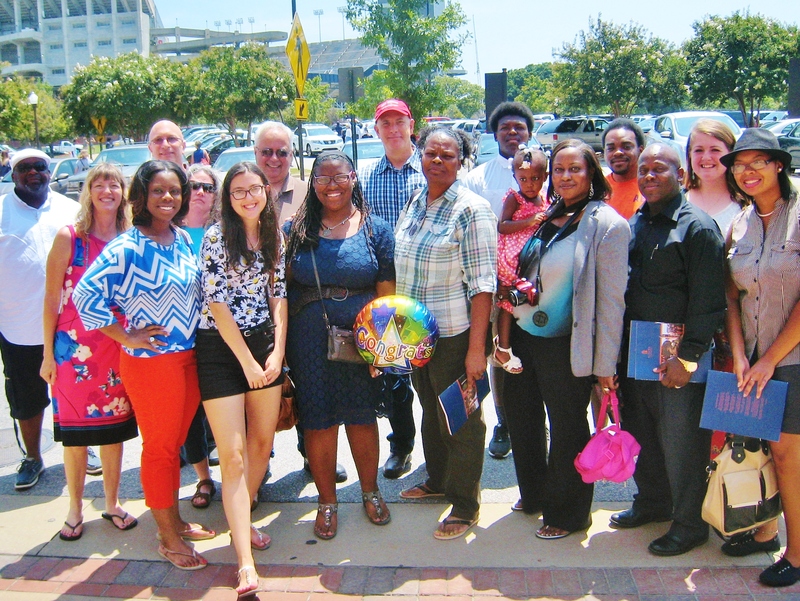 Antoinette’s graduation. It has been awesome to watch her growth! Experiencing this with someone is one of my greatest joys. But it also incurs my greatest struggles. I go through their triumphs with them, AND their messes. We have to accept that If we have a relationship with someone, we’re going to experience their mistakes, their foolishness. We have to be PATIENT! Jesus knew that, in the end, all of his teaching about doing right would not be enough. He knew that even with all of our efforts, we would not make enough good choices. Jesus was PATIENT with us. 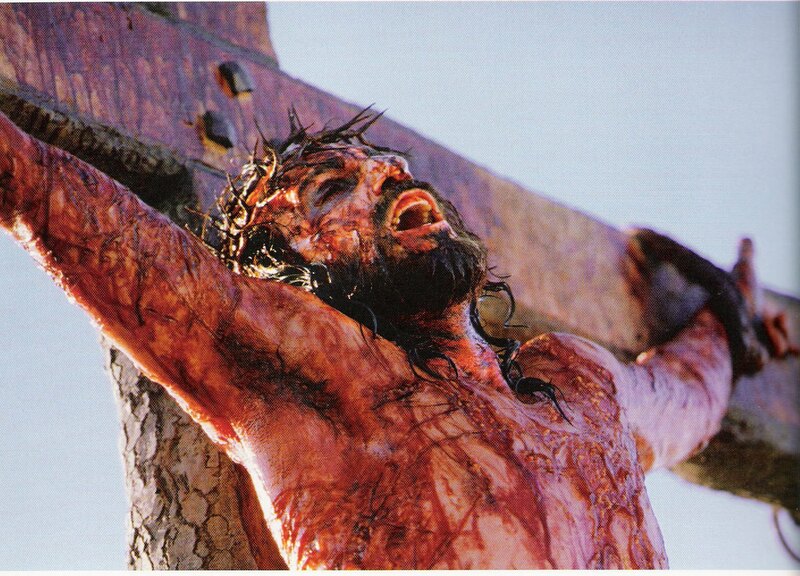 He did not treat us as our sins deserve. Instead, he stepped forward to clean up the mess caused by our foolishness. If we keep that in mind, it is much easier to forgive others for their weaknesses. Let it go. Drop it. Don’t hold onto it. Because that’s what God does with us. And because we recognize that God’s writing a story in each one of us, and that thing we don’t want to forgive is a part of the story. The drama of the story will be in the way He teaches us to overcome. I have to remind myself that I really don’t know how to get people to that point. I know some things that will help. But ONLY GOD knows how to orchestrate character change. I have to pray and let Him guide. 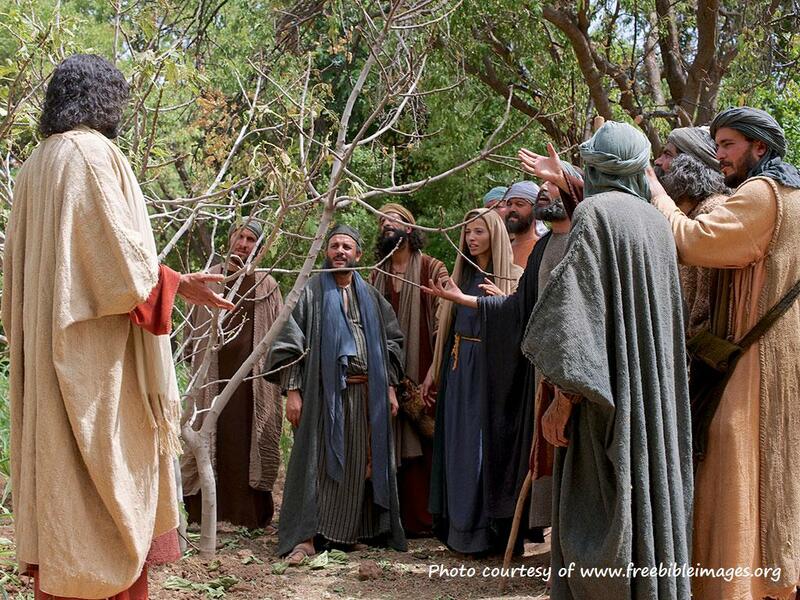 So what does forgiveness have to do with fig trees and mountains, with fruitfulness and faith? Jesus showed us true forgiveness so that we could truly be fruitful and our prayers be answered. It’s all connected, following Jesus, forgiving, bearing fruit. One leads to the other, which leads to the other. God gives his love to us, the unworthy, and we pass it on. And that opens the way for God to work in us and through us. Let’s pass it on. Let’s practice forbearance, not frustration. And we will experience abundance and happy endings.